Looking for a Hudson Valley pool contractor to build or remodel a gunite, fiberglass, or vinyl pool for your home? Blue Haven can create a distinctive aquatic resort with aesthetic and functional elements to achieve—and surpass—your family’s backyard dreams. You can have any size or shape of inground pool & spa—and one that reflects your style preferences and accommodates your property. Whether you opt for a sleek contemporary geometric shape or a curvy, free-flowing one that mimics a country pond, our Hudson Valley pool-construction team can build the “liquid asset” you want for your home. Your custom pool & spa don’t stop at the waterline, and neither do your options for outdoor amenities to compliment them. We can design a complete backyard makeover that includes deck installation, as well as landscape design with our expert partners such as Damiano Landscaping and Johnsen Landscape. To create the ideal setting for your new aquatic retreat and backyard lifestyle, our projects frequently include other enhancements such as steps, walkways, fire pits, and fireplaces retaining walls, built-in island barbecues, and complete outdoor kitchens. 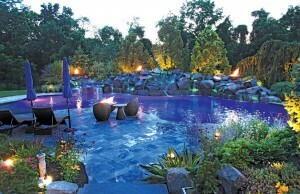 Enjoy peace of mind with Blue Haven Pools Hudson Valley. First, you get the confidence that comes from a pool industry name trusted since 1954 with offices coast to coast—including another New York office in Westchester County. Second, you can expect hometown service and a high-level of local expertise on your pool project. Here’s why: Each one in the Hudson Valley is personally designed and supervised by our regional manager, Dominick Solitario. And for inground pool installation and construction, it’s hard to compete with his track record. A native New Yorker, Dominick brings more than four decades of local industry experience to every client’s new inground pool. Whether he is creating a dramatic negative-edge pool design or developing a construction tactic to overcome a steep backyard slope, you can count on his well-honed skill set for making your project a total success! Get started on making your new backyard resort a reality. Contact us for a complimentary pool brochure and in-home quote. We will develop a pool plan custom-designed for your home and family needs.